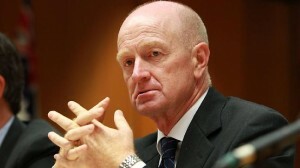 The Royal Bank of Australia’s (RBA) Governor, Glenn Stevens, has talked the markets out of pricing in further interest rate cuts for at least another year, calling for “animal spirits” to catalyze economic growth in the Australian economy. Delivering his semi-annual testimony to a parliamentary panel in Brisbane, Mr. Stevens was adamant that record low interest rates of 2.5% cannot single-handedly drive confidence or spur business activity in Australia. Mr. Stevens was content in having “done all he possibly could” to create the necessary conditions for Australian businesses to prosper. The RBA Governor was quoted as saying: “We need an environment where there is more confidence to move ahead. I’ve allowed the horse to come to the water of cheap funding, but I can’t make it drink”. Mr. Stevens sees several engines for future economic development in Australia – primarily via low funding costs, a hefty rise in household net worth, strong population growth and opportunities to tap Asia’s expanding middle class. Veiled and slippery words to be sure. Overall, Mr. Stevens’ comments were taken as broadly AUD negative by traders which helped the AUD to fall as low as 0.9277 against the USD and 1.4331 against the Euro before recovering some ground towards the end of the Asian trading session. Market analysis conducted by Forex Magnates suggests the majority of traders expect the RBA to keep interest rates on hold until at least September 2015. The Australian dollar is currently trading around 0.93 (well above the 2014 low of 0.8660) having trended lower since 2012. Market participants have become accustomed to seeing dovish monetary policy from the RBA and thus have maintained expectations of future low rates for some considerable time – in line with similar dovish policy enacted by other G7 central banks, such as the Fed, ECB and the Bank of England. As economic conditions start to improve, several central banks, including the RBA, are considering a turnaround in their monetary policy stance. With rate expectations now anchored and having more potential to rise rather than fall in late 2015, the likelihood of carry traders once again being attracted to the Australian dollar has increased. The AUD/USD downtrend is likely to struggle if higher rate expectations start to gain market traction while the Federal Reserve remains actively engaged in zero interest rate policy (ZIRP) beyond October 2014. The changing landscape of interest rate policy (and their future expectations) between various central banks continues to drive currency valuations in the FX market.